Get outside and have fun with the whole family this winter. 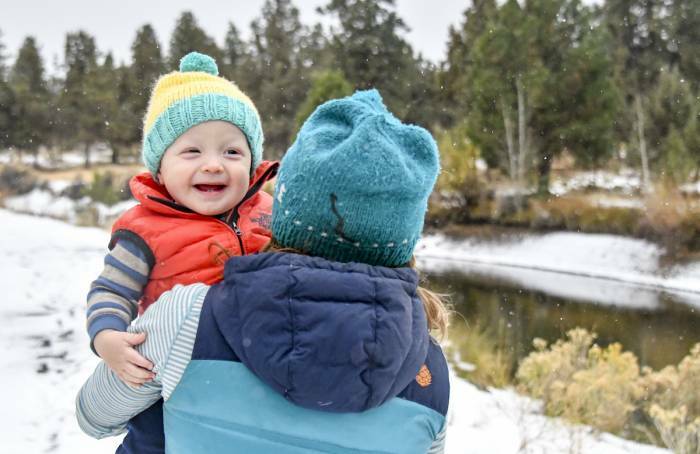 Our favorite gear for layering kids in cold weather keeps the little ones cozy. Honestly, there are some mornings I look outside and think, “Maybe we should just stay inside today.” It would be so much easier. But, inevitably, after a few minutes, my adventurous self gets the best of me, and we are headed out the door all bundled up and ready to brave the elements. No matter how long it takes to get ready, I never regret it once we’re outside. Because kids and babies are just like us (or are we just like babies?) — they love to be out in the fresh air. But if your little one is anything like ours, then you know how hard it is to dress a squirmy, screaming baby. Our son Max is now 10 months old, and while I thought he would grow out of hating putting clothes on, the dislike for it is only getting stronger no matter how many songs I sing! When it comes to getting your little one dressed for the colder months, I have some favorite layering tips and pieces of gear that will keep them warm and comfortable all winter long. 1. Does your baby run hot or cold? Some babies are naturally warmer, and some run on the cooler side. Ever since Max’s first day with us, he has been a little heater. And then I have friends with babies and tots who are always wrapped up in multiple layers, and they seem to be good with it. 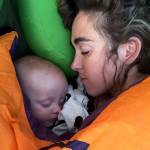 Check on your baby’s temp by feeling their core every once in a while during your outdoor adventure time. If it seems cold to the touch, put another layer on; if it is too hot, take a layer off. And if they’re not fussing and having a good time, then don’t mess with them! 2. How much are they going to be moving outside? Your activity will greatly influence what you dress your little one in. Max just started to crawl, so when we go outside he is either carried in his backpack or pushed in his stroller. Hence, he is not working up a sweat when he heads outside. Tots who are walking are another story, because they want to be able to move easily and without any extra bulk in their way. 3. Remember, it’s easier to take off layers. So far, I am finding that putting on more layers when we are already doing our thing outside is way more of a hassle than taking them off. Before we head out on our adventure, I put a few layers on him knowing that I can easily pull one off if he is hot and fussy. Just like adult base layers, these are worn close to the skin and work best when they are form-fitting. Good base layers wick moisture away from the skin, where it can otherwise cause chills and discomfort. I prefer natural fabrics for babies and tots because they breathe, are not flammable, and do not overheat like most synthetic fabrics. My favorite base layer fabric is merino wool. While more expensive, it is very warm in cold weather, stays cool in hot weather, is soft on the skin, is good for kids with allergies, and does not hold onto water or smells. This small company only makes baby wool layers. Max has been wearing his wool baby base layer set for the past few weeks, and he loves it. The wool is soft and creamy to the touch, but I especially love how the pants come with sewn-in booties. Max wears this on its own around the house, out and about on nice fall days, and under a fleece onesie or down bunting when it’s extra chilly outside. Rompers are the best. They are simple, easy to get on and off, and so cozy. While many parents only use these for pajamas, I often leave this on Max all day long, as it is just too comfortable. For long travel days, this is my number one go-to as well. This romper paired with the down bunting by Patagonia (see below) is the ultimate winter combo for babies. When we go cross-country skiing or biking with him in his Chariot Modular Stroller, he is always in this romper. These super-soft, USA-made merino wool thermals are equally great for long days outside or cozy nights at home. Plus, you can feel good knowing the wool is sourced from a group of ranches in New Zealand and Australia that meet strict animal welfare and responsible ranching standards. 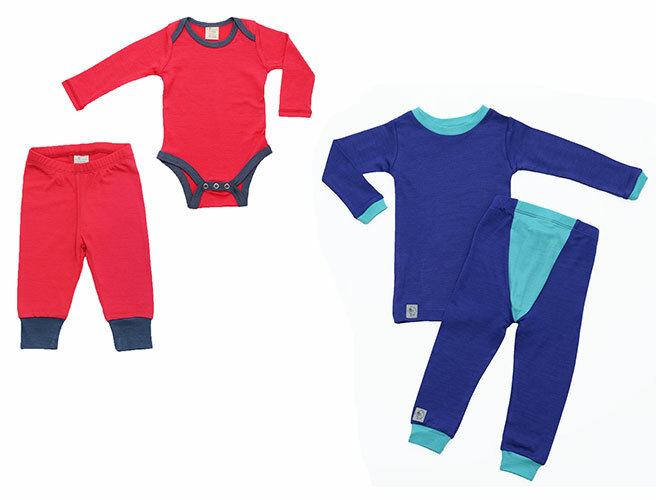 These bright, Canadian-made base layers range from infant to 8-year-old sizes. The merino wool is wonderfully soft, and our tot-sized tester could not stop touching them and commenting on the comfort. Best of all, the wool makes them naturally fire retardant, so they pass children’s wear fire testing without being doused with harmful chemicals. Cute, colorful, and comfortable, these check all the important boxes and then some. Known for making top-notch snowboard and ski gear, Burton brings the same tech and aesthetic to this mini set. 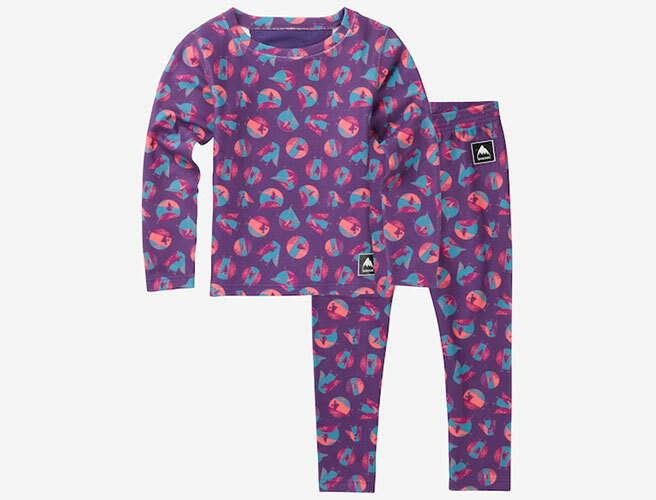 This fleece set is so wonderfully fuzzy your littles won’t want to take it off, and the wicking properties will keep them dry all day long. On top of all that, the chafe-free seams and stretch mean your kiddos can run around with full warmth and comfort. 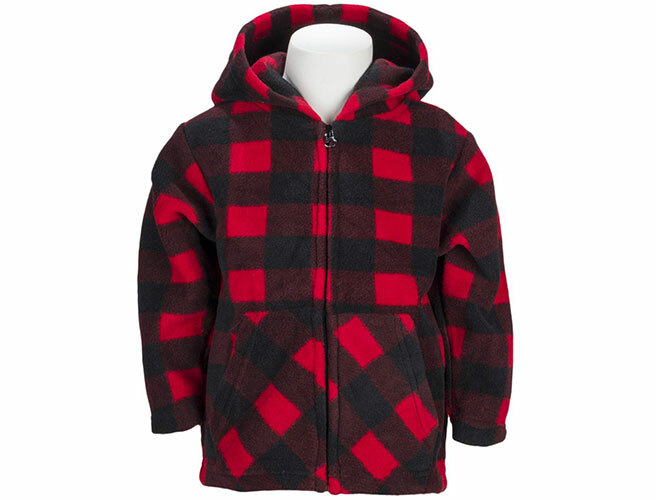 Available in sizes 2T to 5/6, this fleece set will soon become a family favorite. For midlayers, think of pieces that can easily be put on and taken off. They keep the core warm, are lightweight, and still let your little one move freely. These are best for crawlers and walkers, who tend to stay warmer while on the move and don’t want to be all bulked up when they have to go somewhere. In the shoulder seasons, these are the main outer layer kids wear. In the colder months, they can wear all three: base, middle, and outer. When you have a baby or toddler that is hard to dress, vests are amazing. They are easy to put on and keep their core warm. When it comes to baby and toddler outdoor wear, Patagonia has it figured out. 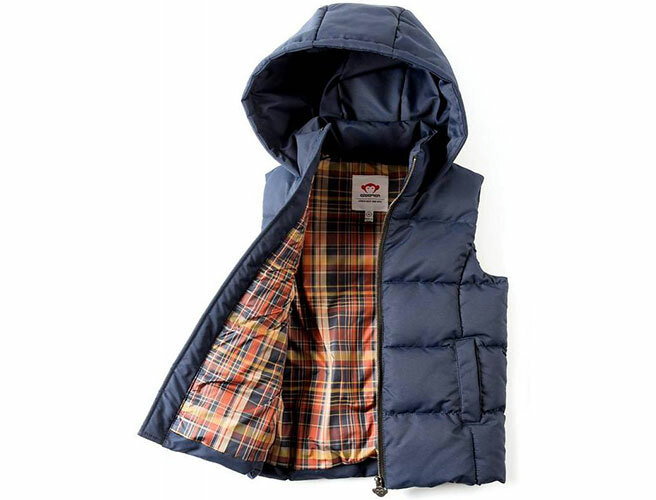 The Retro X vest is both light, warm, and has hand-warming pockets. Many of their baby items run large, but that sizing works with this vest, as it lets Max grow into it. Bottom line: This is a solid, affordable vest. I have these in two colors and am impressed with how lightweight and easy to put on they are. The polyester material is soft to the touch and gives enough warmth for a crisp fall evening or mild winter day. Especially for older kids, hoods can be a convenient built-in head-warming device. This hooded vest from Appaman provides plenty of puffy warmth. Made of polyester, it washes easily and pairs well with a long thermal on days when it’s not quite cold enough for a full jacket, but too cold for a shirt alone. This lightweight fleece hoodie from Columbia lets little ones move freely and keeps them warm at the same time. While I wouldn’t have my kiddo wear it on its own when it’s super chilly out, it is great for days when the temps are above 50 degrees F. He wears it on quick bike rides to and from the grocery store, or walking to his Nanny and Grandpa’s house. 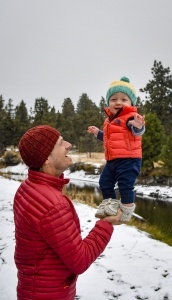 When it comes to getting your baby ready for the elements quickly and easily, the Patagonia Micro D Fleece is all you need. This thing goes on easy and has plenty of room for layers. I especially love the snug hood and that the snaps and zipper are to the side, which keeps anything that could get cold away from his face. We’ve had this for a week, and there hasn’t been one day where he has not been in it. 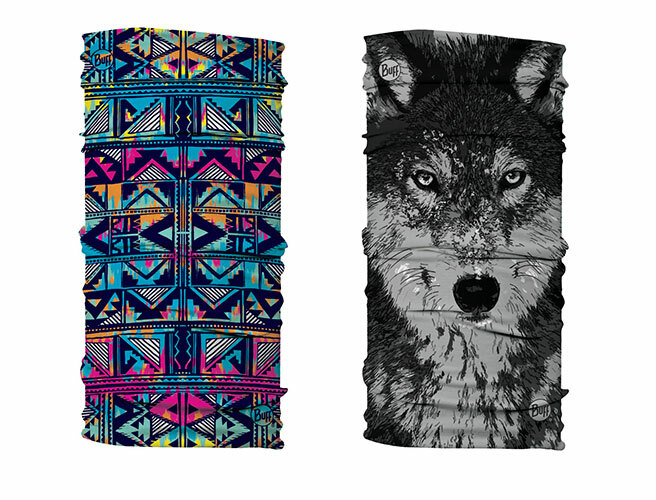 It is perfect for our runs, bike rides, and hikes, as he is always happy and warm in it. I grew up coveting my Hanna Andersson pajamas, and now I can pass on the love to my little one. This sweater pant set is made from a blend of merino wool and cotton, making it extra comfortable, soft, and moisture wicking. This outfit is one that will be in the family for a long time, and Max is in it almost every other day. It is a great layering piece when put over a wool base layer and under his vest for our crisp morning walks. By the time we are at the park, it’s warm enough to take off the vest for some play time. Looking for a fleece hoodie at an affordable price? This could be just what you’ve been looking for. Made of a soft polyfleece and complete with a front pocket, this jacket is a comfortable winter layer. It may not be the most technical on the list, but for a long-lasting zip-up jacket that won’t break the bank, check out the Trailcrest hoodie. Max slept in this when it was 28 degrees F out during a late-fall camping trip. He slept the entire night without a peep. When we picked him up in the morning, he was toasty warm and happy. Now that it is getting colder and colder outside, we are starting to put him in this for all of our outdoor activities. Being extremely warm and cozy, it is not the best for toddlers who are running around like crazy. It is, however, perfect for Max, who is still happy as a clam sitting in his Chariot or kid runner while his Mama or Daddy pulls him. Again, Patagonia runs extra big for kids. Max is 10 months old, and we are still squeezing him into his 3- to 6-month-sized one. This set is sold separately, but I highly recommend it as a combo. Both the Puff-Ball Pants and Jacket are warm and thin, meaning toddlers can run around in them and not feel like they are tiny marshmallows bumping into everything. This jacket is the first one Max didn’t put up a fight against. The pants are also great for when you need to change a diaper quickly, as it gives parents easy access for quick turnaround. The North Face makes some great baby and toddler gear that is both functional and durable. This insulated, lightweight jacket is one that is easy to get on and is extra, extra warm. For outings where it’s not cold enough for the down bunting but too cold for just a vest or light jacket, we reach for this. And with the newly released Mount Chimborazo we get this same reversible warmth plus an adorable and cozy, fuzzy fleece. It’s like two jackets in one. This waterproof snowsuit keeps babies and kids warm and dry no matter the conditions. And, as opposed to the typical slick outer, this winter suit has a soft brushed poly. It does seem to run small, so order up a size and check the measurements for a good a fit. Anyone wanting a performance, reversible puffy jacket should take a look at the Minishred Flex Puffy. The DWR coating repels water so playing in wet snow isn’t a concern. And the mapped synthetic down insulation will keep the mini in your life plenty warm. Slope skills and gnarly tricks aren’t guaranteed, but at least your kid will be warm and stylish whether hitting the slopes or running on the playground. Let’s face it, at some point your kiddo is going to get a mind all her own. A mind that has very strong opinions about fashion and comfort. This is where the kid-pleasing Appaman Puffy comes into play. The warm down insulation, full hood, and snow-battling cuffs will make parents happy while the sparkly, fun exteriors make kids happy. Best of all, it’s easily machine washable, so pint-sized spills are no problem. Now that you’ve got the rest covered, it’s time to think about those final warm touches. Hats, socks, boots, and blankets keep kids warm and happy so you can spend less time fighting the cold and more time playing in the snow. While handmade knit hats are amazingly cute, not all of them make the cut. Look for ones that are stretchy and soft. Nothing is worse than trying to pull a small hat onto a screaming baby. For Max, hats that snap under his chin or tie are the most reliable. They stay put and keep his ears covered. The fur-lined hat from Pistil ($34.95) is a fun take on the classic trapper hat, and the adorable Turtle Fur Penguin hat ($28) makes kids and adults alike grin from ear to warm ear. And our go-to for squirmy tots is the Patagonia Synchilla Fleece Hat ($29). There’s really no limit to how a Buff can be worn. From a winter hat to summer headband, from a neckwarmer to a full-coverage baklava, these versatile sleeves of polyester microfiber should be in everyone’s adventure kit, including youngsters’. 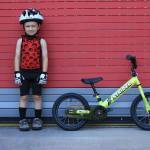 The Junior line is sized down to fit ages 6 to 11 years old, though we’ve seen younger and older kids make them work. Get your kid a fun print they love, and you’ll be set all year round. For anyone who’s ever lost half a day trying to finagle a tiny thumb into the correct slot, we present the Veyo Mittyz. These thumbless mittens are a dream to put on, with their wide opening and long cuff. And the buckle and elastic pull keep snow out and mittens on. Any sock that does not go up to the knee is useless. On babies and toddlers, their pants rise up, leaving a good portion of their leg exposed. And active babies will quickly rip off short socks. Luckily, these longer socks do the trick. The Warrior Baby Alpaca Socks ($9.49) are delightfully soft and also help regulate body temperature. 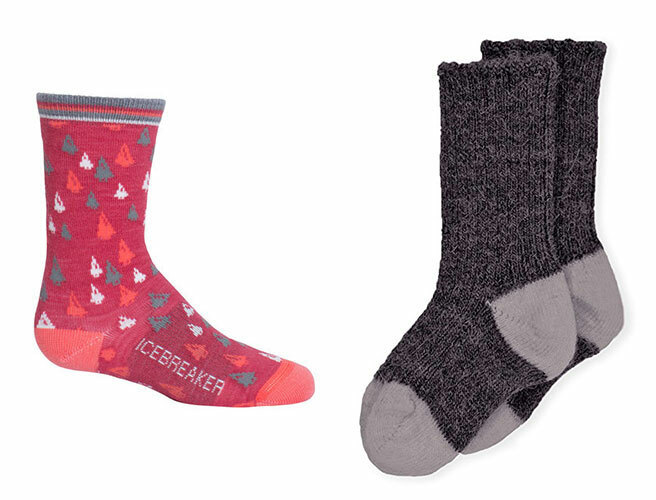 And the Kids’ Lifestyle Ultralight Crew from Icebreaker ($14) provides the same merino wool performance and lifetime guarantee we love in their adult socks. Designed and tested in Canada, these kids’ snow boots are meant to withstand even the harshest winter outings. For babies and toddlers, the booties are designed for a quick slip on and can be worn alone or over shoes. For kids ages 1 to 6, the Scout and Trek Bootz offer slip-resistant soles and soft, velvet interior lining. Best of all, they’re lightweight, so your kiddo won’t get worn out hefting a heavy snow boot around. We always have blankets with us in his Chariot, car seat, and kid runner. They are warm, cozy, and familiar. 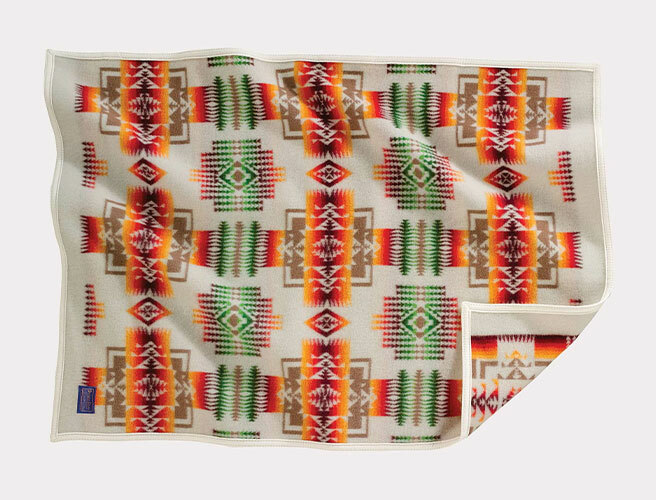 I love our small wool Pendleton blanket because it traps in heat and cuts against wind and even light rain. While it is on the heavier side, it is durable, extremely warm, and, perhaps best of all, beautiful. I hope we hold onto this one for a very long time. For winter-born infants and cold-weather road trips, the car seat-specific warmers are a must. The quilted Nido Blanket (pictured left), is an easy-to-use baby blanket that adapts to any car seat or stroller. Best of all, it was designed to meet stringent car seat safety specs, including the addition of a back cut-out that eliminates extra layers between the baby’s back and the car seat. 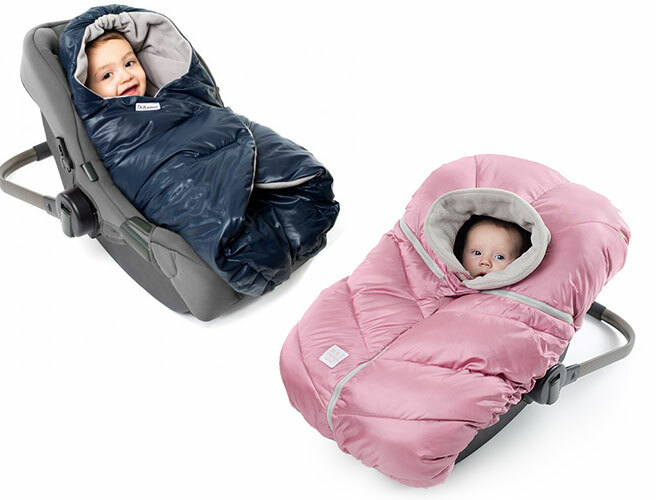 And, if you’re looking for an all-winter-long option, the Car Seat Cocoon slips easily over a car seat and has a micro-fleece lining and zippers to regulate temperature. We hear you: Kids’ clothes can be outrageously expensive. On the one hand, we want our baby to be comfortable on outside adventures. But, on the other hand, we still need a few bucks left in the bank for said winter adventure. We’ve found a few strategies for gearing up for winter without breaking the bank. First, before you drop a ton of money on winter gear for your baby, tot, or kid, check out your local thrift stores and used gear stores. Ask your fellow parent friends if they have anything they want to get rid of. Having a go-to source for secondhand gear can be a real treasure. Next, prioritize and think about how often you’ll really use something. We splurged on a couple Patagonia and merino wool pieces knowing that Max would be in them for five months straight. We also hope we’ll have another one who can wear it next. Most of all, just get out there. Whatever gear you end up choosing, your kid, your sanity, and your family memories will thank you for making the effort to get outside, even when the temperature drops and the snow flies. Have a favorite we didn’t cover? Let us know, and we’ll check it out for future updates to the article.